I’ve noticed in recent years that Spare the Air Alerts are happening a lot more often-that’s when air quality is poor and people are encouraged to stay indoors and reduce poluting activities such as driving and burning fires in the fireplace. Rather than wait til it comes on the news, you can find out in advance by signing up for Spare the Air Alerts via email or phone. 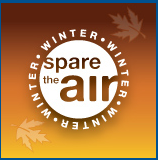 Go to SparetheAir.org to sign up and find out when not to use fireplaces, when your car should be left at home. Winter Spare the Air season runs from Nov. 1 to the end of February, although, occasionally, a Spare the Air event can occur outside those dates. The best solution is to be thoughtful about air polluting activities everyday, by cutting down on car trips, carpooling, taking public transit and reducing the use of fireplaces.